Mobile workers move farther from the applications and data they need, yet require faster response times and “always on” availability. At the same time, economic pressures force technology managers to lower hardware costs, drive out redundancy, and reduce overhead. 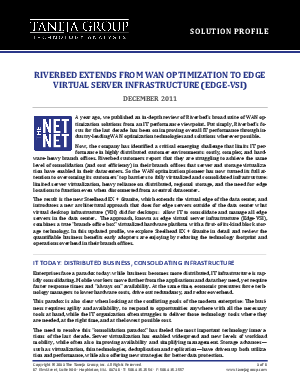 In this report, Taneja Group explores how Riverbed Technology has identified a critical challenge that limits IT performance in highly distributed customer environments: costly, complex, and hardware-heavy branch offices. The report profiles the new Steelhead EX + Granite appliance, combining a true “branch-office box” virtualized hardware platform with a first-of-its-kind block storage technology. Download now.